While the aim of our early childhood curriculum is to awaken physical capacities and strengthen the will of the child, the goal of our grade school curriculum is to stimulate the feeling life of our students. Lessons are taught experientially, and the arts and storytelling are integral to all academic instruction. Students learn to find beauty in learning, in the world, and in each other. The Class Teacher ideally takes the same class of children through eight years of grade school, teaching all the Main Lesson subjects. For the teacher, this means time to really get to know the children and help their gifts unfold. For the students, this relationship offers stability and guidance. Main Lesson is the two-hour period every morning in which the main subject of the day is presented. That subject―for example, mathematics, history, botany, or acoustics―is taught daily for a 3- or 4-week block and then put aside, perhaps to be continued later in the term. This approach allows for concentrated, in-depth experience; freshness and enthusiasm; and time to digest what has been learned. We do not use textbooks. Instead, after teachers have presented material to the class, the students create individual books for each subject, recording and illustrating the substance of their lessons. These artistic and beautiful creations are an important way in which art is integrated into every subject. Number and letter grades are not given at our school until 7th Grade. At the end of the school year, teachers write progress reports, which present a picture of the child’s academic, artistic, and personal development as well as a description of the material covered in each subject. Conferences are scheduled twice a year to provide parents and teachers an opportunity to share their impressions and concerns. Additional conferences may be scheduled at any time when parents have a special concern about their child. We do not conduct standardized tests and homework does not begin in earnest until around 5th grade. The HVWS Leadership Council and College of Teachers forged a relationship with the Women’s Center of Greater Danbury in 2016. This organization offers workshops and presentations for students of all ages on topics such as Cyber Safety, Bullying and Upstanders, and Forging Healthy Friendships. We are pleased to welcome the Women’s Center to HVWS for regular workshops with grade school students. Additionally, in 2018 we are adding a Cyber Civics block to our middle school instruction. Letters are learned the way they originated in human history: first graders hear stories, draw pictures, and discover the letter in the gesture of the picture. This process is accompanied by phonetic work in songs, poems, and games, helping to establish a joyful and living experience of language. Through the grades, texts taken from the humanities curriculum―for example the book of Genesis, the Bhagavad-Gita, or the Kalevala from Finland―provide material for reading practice. The Humanities begin in first grade with folk and fairy tales and continue in second grade with mythology and legends; third grade with Old Testament stories; fourth grade with Norse mythology; and the ancient cultures of India, Egypt, Persia, Mesopotamia, and Greece in fifth grade. These studies provide the background for the study of history and arts presented through excerpts from original texts. By living in these cultures through their legends and literature, students gain flexibility and an appreciation for the diversity of humankind. By the close of eighth grade, the children have journeyed through Rome to the Middle Ages, the Renaissance, the Reformation, the Age of Exploration, and up to the present day. Reading from the world’s great literature reveals the pain and joy of modern consciousness. In creative writing, stormy moods and emotions are explored through the writing of poems, short stories, and expository and persuasive pieces, with grammar’s structure providing boundaries. Writing assignments like book summaries and research reports include accurate, as well as narrative, descriptions of science experiments. Recitation of the world’s great poetry, echoing the human drama, continues through our middle school classes. Debating—between Roman orators, for example—develops emerging reasoning skills and satisfies argumentative tendencies in growing adolescents. The teaching of mathematics begins in the first grade with the four arithmetical processes and continues through algebra and solid geometry in eighth grade. In addition, the abstract principles of mathematics are infused into many other aspects of the curriculum. In the early years, jumping rope is a venue for learning to count. Playing the recorder teaches the concept of intervals. Proportion and scale are studies partly through geometric drawing and woodworking. Clay modeling offers an opportunity to sculpt Platonic solids. This multi-disciplinary, and often initially tactile, approach resonates with children and leads to an in-depth understanding of mathematical principles. The Sciences are taught experientially: the teacher sets up an experiment, calls upon the students to observe carefully, ponder and discuss, and then allows them to discover the resulting law, formula, or principle. Through this process, rigorous, independent thinking and sound judgment are trained. Students progress from learning about nature through the direct experience of a nature walk, to the study of Zoology, Botany, Mineralogy, Astronomy, Physics (including Optics, Thermal Physics, Acoustics, Static and Current Electricity, Magnetism, Mechanics), and Physiology. 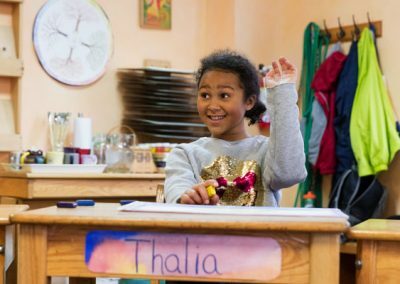 The goal of world language teaching in Waldorf Schools is to encourage a positive attitude towards people of other cultures and languages. We strive to foster human understanding through language and culture. We help the students see the world in a different way and broaden their own perspectives. At HVWS we teach Spanish and German. Learning a new language strengthens the ability to listen to another person, to follow and grasp the other person’s spoken and unspoken intentions. Being competent in multiple languages supports the capacity for flexible, mobile thinking, since different languages access different realms of experience, and this in turn stimulates greater interest in the world and other people. 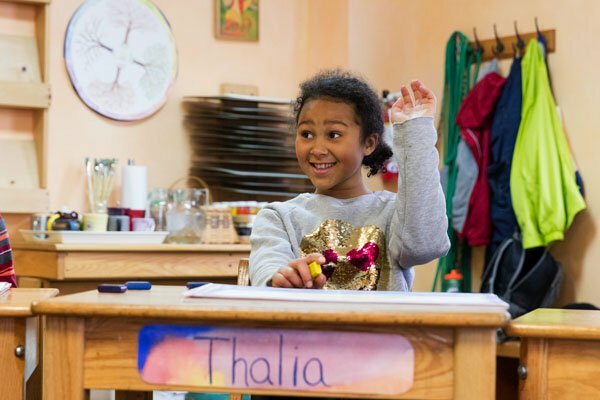 Language classes are taught orally in first through third grades through everyday conversation, traditional songs, poems, stories, and games, with the addition in fourth grade of writing, reading, and grammar lessons. Classes are conducted in the target language. Visual arts are infused into nearly every academic subject in the Waldorf curriculum through varied techniques including drawing, painting, and clay modelling. The events and heroes of history and mythology are depicted in students’ watercolor paintings. Precise geometry is studied through drawing with compasses and other mechanical equipment. Studying the Renaissance, students retrace the discovery of perspective drawing, which requires both technical mastery and philosophical inquiry, as in: do I trust what I see, or what I know to be there? Animal and human forms are explored in freehand drawing. All students write and draw their own notebooks for main lesson and other subjects to record their academic and artistic accomplishments. 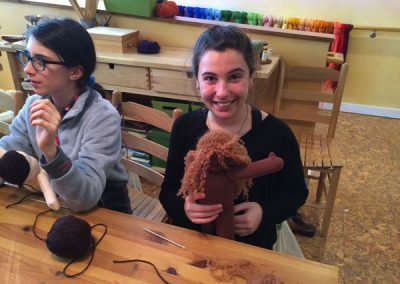 Practical arts, handwork, and crafts are an integral part of the Waldorf curriculum. Decades before brain research could confirm it, Rudolf Steiner recognized that brain function was founded on body function. Learning these skills in the early grades leads to motor skills that later metamorphose into lively thinking and enhanced intellectual development. Coordination, patience, perseverance, and imagination are developed through practical work. The creation of beautiful handmade objects, increasingly rare in a utilitarian society, also feeds the child’s sense of accomplishment and aesthetics, and the use and movement of hands and limbs offer an important counterpoint to intellectual pursuits. Our students develop increasingly complex artwork through their years in middle school. 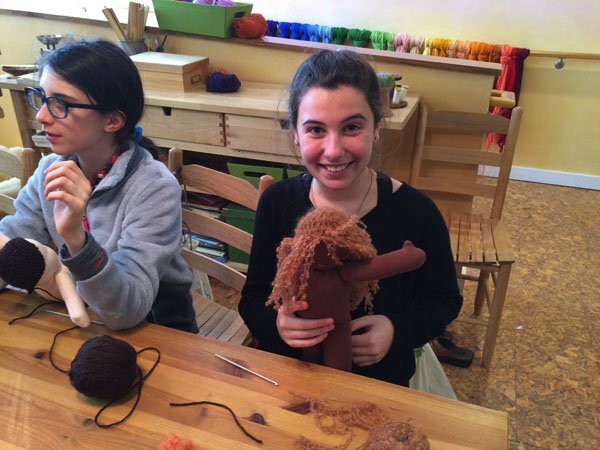 Sixth graders sew a cloth doll or stuffed animal, combining technical skill with a new-found awareness of the human or animal form. Seventh graders design and knit a full-size wool sweater—a lengthy project requiring concentration, consistency, and purposeful work. To enhance their study of the Industrial Revolution and their fascination with technology, eighth graders use a sewing machine to create a garment. 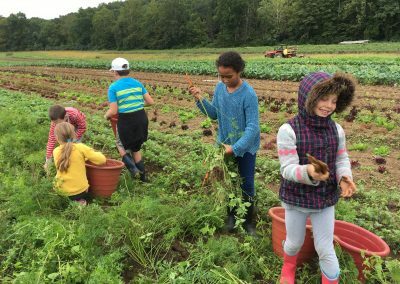 Music permeates life in the Waldorf school through a curriculum designed to develop the innate musicality with which every child is born. In first grade, students sing and learn to play simple wooden pentatonic flutes. Both activities are practiced daily through the elementary school years. In third grade, diatonic flutes are introduced and all students begin to play a string instrument. Students may choose a wind instrument beginning in sixth grade. In the upper grades, all students belong to the Chorus and Orchestra. This demands increasing precision and skill as students study more sophisticated pieces. There are two concerts a year at which both groups perform. In addition, all students play 3- or 4-part music in their class Recorder Ensembles. Music is taught not only for its own sake and the joy it engenders, but also because it brings a strong harmonizing and humanizing force into the child’s life, strengthening the will and capabilities for the future. Every grade performs a class play each year, with the subject arising from the curriculum of the main lesson. The presentations become more complex as the children can handle longer verses and separate parts. By the upper grades, the children are capable of complex and sophisticated plays–often Shakespeare in eighth grade–including lots of memorization and more elaborate costumes, props, blocking, choreography, and singing. Producing a play, from beginning to end, is an experience that creates and reinforces the social bonds of the class. Form drawing is unique to Waldorf schools. It allows one to experience the inner nature of things through movement—which is one of the basic learning modalities of the early grades. First, the students move with their whole bodies to create shapes; then they draw the shapes on chalkboards or paper. The shapes are archetypal patterns and designs such as those found in nature, incorporating straight and curved lines that freeze the movement, making it visible in space. Through form drawing, the students learn to recognize the inherent qualities and characteristics of different forms—aspects such as balance, direction, proportion, repetition, symmetry, tension, and relaxation—though they are not explicitly identified. Form drawing is therapeutic for all ages. It enhances one’s ability to concentrate, strengthens spatial orientation and eye-hand coordination, and helps with sequencing and tracking for writing and reading. It can soothe a hyperactive person and stimulate a sluggish one. Form drawing also strengthens the capacity for imagination; a lively ability to recognize the form or configuration of things can later transform into a keen sense for grasping the essential soul gesture of a story, object, person, or situation. Physical education classes are an integral part of every grade’s curriculum. Students enjoy games and sports, which improve coordination, balance, and rhythm. Teamwork is always emphasized over competition. Every year our fifth-grade students travel to compete in an inter-school “Olympic Pentathlon” with other Waldorf fifth graders. The athletes compete in wrestling, long jump, javelin, discus, and relay races. Upper grades students often participate in after-school sports programs outside of the school. 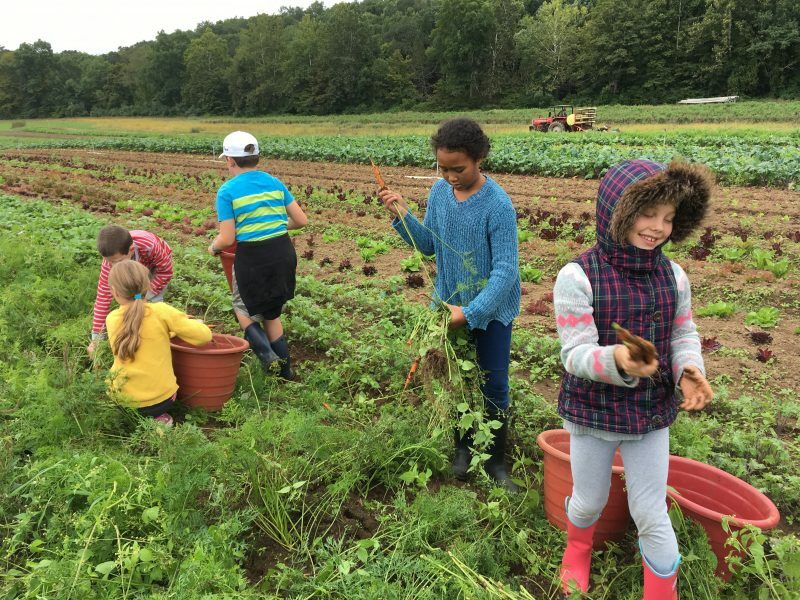 Recess at HVWS, as in Waldorf schools everywhere, is an integral part of the rhythm of every day―an “out breath” to the “in breath” of academic study. After concentrating in class, students of all ages interact at recess and work out the lessons they have internalized from the curriculum. Recess is also crucial to social inclusion. One of our golden rules, “You can’t say, ‘You can’t play! '” can easily be heard from a young student engaging in play with others―for it is often through encounters on the playground that children can find their way with each other. Traditional country dancing (including square dance, international folk dance, whole-set contra dance, play party/singing games, English country dance) supports the curriculum and stimulates creativity, focus, and positive interaction between students. The Morris and Longsword dances taught for May Fair encourage increasing levels of teamwork. Through traditional dance students increase their confidence, social skills, and cooperation while having fun.